Our first free Data Studio template for Google Analytics focused on high-level metrics for a monthly overview of site performance. But if customers spend money on your site, you’ll want a report that highlights ecommerce metrics, too. We’re happy to help! 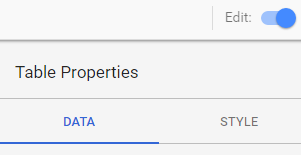 If you haven’t used Data Studio yet, allow me to introduce you to this new tool from Google. Data Studio makes it easy to create and share interactive reports with your colleagues, using data from one or more sources in the same report. We’ve created a Data Studio ecommerce report that shows only data from Google Analytics, because it’s based on the free Google Analytics Demo Account. If you don’t have your own ecommerce data, the demo data lets you experiment and learn Data Studio with our free template. 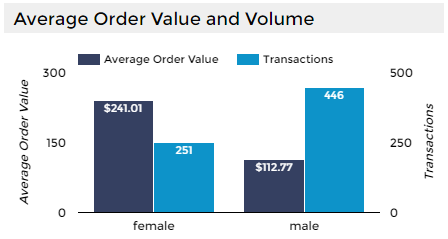 Our Data Studio report for Ecommerce adds a few new tricks to the overview template! Click the template button, but do not request access. Instead, add your own data source following Steps 1 through 8 for our Data Studio overview template. Or you can use the Google Analytics Demo Account as I did throughout this post. Read the linked article to get demo account access if you don’t already have it. Step 2. Check out the Sparklines! To create a sparkline, choose the Time Series chart option. On the Style tab, un-check “Show axes” and select “No Legend”. Re-size. It’s that simple! We’re comparing based on gender, because the demo account has Demographic Reporting enabled in Google Analytics. But you can replace “female/male” in this chart with any dimension that has only a few values. For example, you could compare User Type (New vs. Returning). You could also use one of your own custom dimensions to define audiences for this purpose. Click the Edit toggle at the top right of the report and then click the chart to see our bar chart options. On the Data tab we added a second metric, and on the Style tab we checked “Show data labels” and “Show axes” (Double). For both the left and right axis we checked “Show axis title”. If you have Enhanced Ecommerce data, you can add metrics like Buy-to-Detail Rate, which show how often someone who viewed a product actually bought that product. Or you could change the Product dimension to Product Category, for a roll-up view of your product performance. It’s easy to change the metrics and dimensions in Data Studio – make sure your Edit toggle is in Edit mode and then select a chart to change the options on the Data tab. We kept the filters from our original Data Studio template so you can explore your ecommerce data the same way! You can edit the filter options as well. Add another filter or revise an existing one. For example, you might want to create a filter based on a custom dimension. 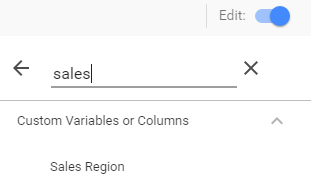 The Google Analytics Demo Account has a custom dimension for “Sales Region” which you can try with this template if you have access to the demo data. 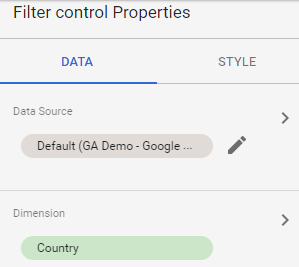 The screen shots below show how to change the Country filter to a filter for Sales Region – edit the Filter control properties and choose the custom dimension by searching the list. Search for your own custom dimensions and change the filters to make them more useful and relevant for your ecommerce reporting! Stay tuned for more Data Studio goodness from Us! We have lots more Data Studio ideas coming your way soon. And we’re always happy to hear from you about unique challenges or discoveries. Please share in the comments!